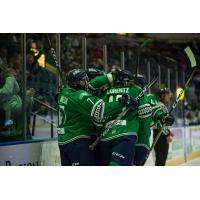 ESTERO, Fla. - In the midst of a season-high eight-game unbeaten streak, the Florida Everblades (11-5-4-0, 26 pts.) continue a stretch of six straight games at home with three games in four days this week. Florida continued its winning ways this past week by earning five of six possible points against South Carolina in a three-game set at Hertz Arena. After dropping a 1-0 decision in North Charleston, South Carolina, on Nov. 16, the Everblades responded with a series victory against the Stingrays in the only meetings between the two teams in Florida this season. The Everblades face the top team in the South Division on Wednesday with a matchup against the Jacksonville Icemen before battling the Greenville Swamp Rabbits for the first time this year on Friday and Saturday. Saturday night is the annual Teddy Bear Toss presented by Florida Community Bank, and the 'Blades will wear specialty jerseys that will be auctioned off postgame to benefit the Animal Refuge Center. With a 2-0-1-0 record last week, the Everblades extended their season-long unbeaten streak to eight games (6-0-2-0), the second-longest point streak in the ECHL this season. Despite missing four games while on recall to the American Hockey League's Charlotte Checkers, Steven Lorentz is second on the 'Blades in scoring with 21 points (8g-13a). He notched his first multi-goal game of the season on Saturday for his team-leading sixth multi-point game of the year. Following his fourth multi-point game of the season on Saturday, Jordon Southorn now has 17 points (2g-15a) and ranks third in the league for scoring among defensemen. Blueliner Derek Sheppard has also had offensive success. The Ajax, Ontario, native is fourth among league defensemen with six goals, while his four power-play goals are tied for the league lead among defensemen. Joe Cox (+16) and John McCarron (+15) are second and third in the ECHL in plus-minus rating, respectively. Cox finished the month of November as a +15 rating and received the AMI Graphics ECHL Plus Performer of the Month honor for his league-leading month. Florida scored three of the four goals in the second period on Saturday and is an ECHL-best plus-14 in the second period this season. The Everblades have yielded only two power-play goals at home this season and have an ECHL-leading 93.5 percent conversion rate (29-for-31) on the penalty kill on home ice. Florida is second in the ECHL in goals allowed per game (2.50) and shots allowed per game (27.8). $2 Wednesday (Dec. 5) - It's a $2 Wednesday when the Everblades take on the Jacksonville Icemen, the first-place team in the South Division. John Morrell hots dogs, Bud Light drafts, and Barefoot Wine are just $2 each! Bottomless Popcorn Friday (Dec. 7) - It's a bottomless popcorn and kids eat free in the Breakaway Sports Pub Friday as the Everblades face the Greenville Swamp Rabbits for the first time this season. Teddy Bear Toss (Dec. 8) - It's the biggest night of the season as the 'Blades host their annual Teddy Bear Toss presented by Florida Community Bank! The Everblades will wear specialty jerseys that will be auctioned off after the game to benefit the Animal Refuge Center. Catch all the exciting action of Everblades hockey on WJBX News, Talk & More on 101.5 FM, 104.3 FM, 770 AM on the radio waves, or listen for FREE online here.